Lean is Simple: Simply Done, All in One | Grunau Company, Inc. Lean is simple. It is all about eliminating waste to provide better value to our customers. We recently cleaned an area that helped our employees be more efficient so they, in turn, can be more productive for our customers. When there is excess material in a space, it takes more time to rummage through things to find the actual material that you need. Our estimators, purchasers, and project managers used to utilize vendor catalogs for product information on a daily basis. The internet now houses current product information and vendors often don’t even print or update paper catalogs anymore. Grunau still had 8 bookshelves filled with old catalogs just because no one took the initiative to sort through what is needed and toss what is not. Consequently, we found layers of dust on some binders showing no one touched in years. Others had not been revised for over 20 years. A few persuasive emails requested staff to indicate which catalogs they wanted by placing a small sticker on the spine. Then a Friday was picked by the Admins to simply get it done. 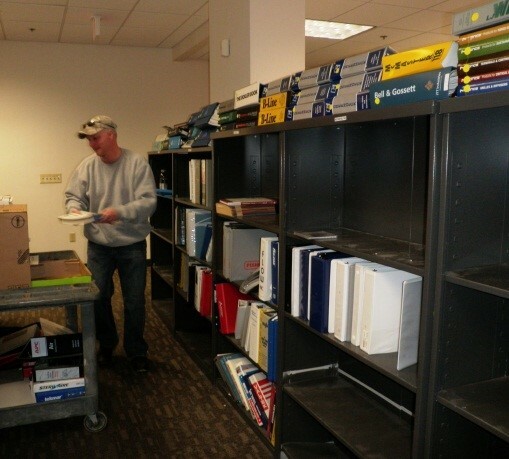 A light-duty worker stepped in to help, and our mailroom runner took on the heavy-lifting of moving bookshelves. Binders that were reusable were emptied and placed in our office stock. All recyclable paper was tossed in our recycle bin. Then the rest was pitched in the dumpster. The 7 emptied bookshelves were sold cheap to employees, with the token $ amount going back into our furniture account. Catalogs we wanted to keep for now were sorted and re-alphabetized into one remaining bookshelf. Before finalizing the project, our code books were moved over by the remaining catalogs so they are more visible and accessible rather than tucked away in a back aisle. Reducing the wastes of excess motion and inventory were our goal. Our result was one bookshelf within one day. Simply stated: we got it done.